Welcome: Imagine if all staff members in your school considered it their job to make every student, parent, and visitor feel noticed, welcomed, and valued. Do no harm: Your school rules should be tools for teaching students to become the moral and ethical citizens you expect them to be. Choice words: When the language students hear helps them see their own possibility and potential, students perform in ways that are consistent with that language. It’s never too late to learn: Can you push students to go beyond the minimum needed to get by, to discover what they are capable of achieving? Best school in the universe: Is your school the best place to teach and learn? Drawing on their years of experience in the classroom, the authors explain how these pillars support good teaching and learning. In addition, they provide 19 action research tools that will help you create a culture of achievement, so that your school or classroom is the best it can be. 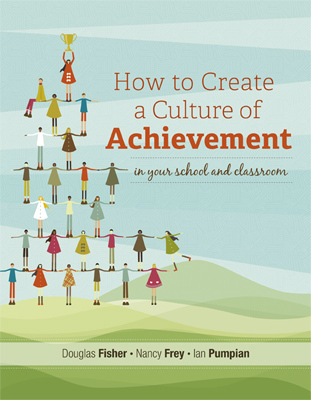 After reading this book, you’ll see why culture makes the difference between a school that enables success for all students and a school that merely houses those students during the school day. "If a school leader—or better yet, a school staff—takes this book and uses it as a catalyst to create dialogue around what the school culture is and what it can be, then I believe it could have a profound impact on the real learning that takes place every day." —Gerald W. Aungst, supervisor of gifted and elementary mathematics, Elkins Park, Pa. This review first appeared on GeraldAungst.com. "Many of the suggestions are easy to implement and should be present in any well-run organization. ... [The book] is primarily aimed at the building level, although it could spark valuable discussions at the district level. Central office staff may want to discuss how the pillars apply to the culture of the district and how principals can be assisted in improving the culture in their respective buildings." —Leonard H. Elovitz, associate professor of educational leadership, Kean University, Union, N.J.
DOUGLAS FISHER is a professor of educational leadership at San Diego State University and a teacher leader at Health Sciences High & Middle College. He is a member of the California Reading Hall of Fame and is the recipient of a Celebrate Literacy Award from the International Reading Association, the Farmer Award for Excellence in Writing from the National Council of Teachers of English, and a Christa McAuliffe Award for Excellence in Teacher Education from the American Association of State Colleges and Universities. He has published numerous articles on improving student achievement, and his books include The Purposeful Classroom, Enhancing RTI: How to Ensure Success with Effective Classroom Instruction and Intervention, Checking for Understanding, and Content-Area Conversations. NANCY FREY is a professor of literacy in the School of Teacher Educa­tion at San Diego State University and a teacher leader at Health Sciences High & Middle College. Before joining the university faculty, Nancy was a special education teacher in the Broward County (Florida) Public Schools, where she taught students at the elementary and middle school levels. She later worked for the Florida Department of Education on a statewide project for supporting students with disabilities in a general education curriculum. Nancy is a recipient of the Christa McAuliffe Award for Excellence in Teacher Education from the American Association of State Colleges and Universities and the Early Career Award from the National Reading Conference. Her research interests include reading and literacy, assessment, intervention, and curriculum design. She has published many articles and books on literacy and instruction, including Productive Group Work and Better Learning Through Structured Teaching. IAN PUMPIAN is a Professor in the Department of Educational Lead­ership at San Diego State University with a Ph.D. from the University of Wisconsin. He has taught, supervised, and chaired dissertations of several San Diego lead principals and area superintendents. He cofounded Health Science High and Middle College and currently serves as the CEO/President. Previously Dr. Pumpian served as the Executive Director of the City Heights Educational Collaborative where he assumed superintendent-level responsibilities over the educational programs of these 5000 students, professional development for their 300+ teachers, and a comprehensive professional development school that annually involved over 125,000 hours of SDSU faculty and student credential and advanced degree teaching, research, and practica activities. Dr. Pumpian has authored and co-authored numerous journal articles and books.